Flexita is a food grater that transforms from two to three dimensions. It is easy to use and efficient to clean and store. 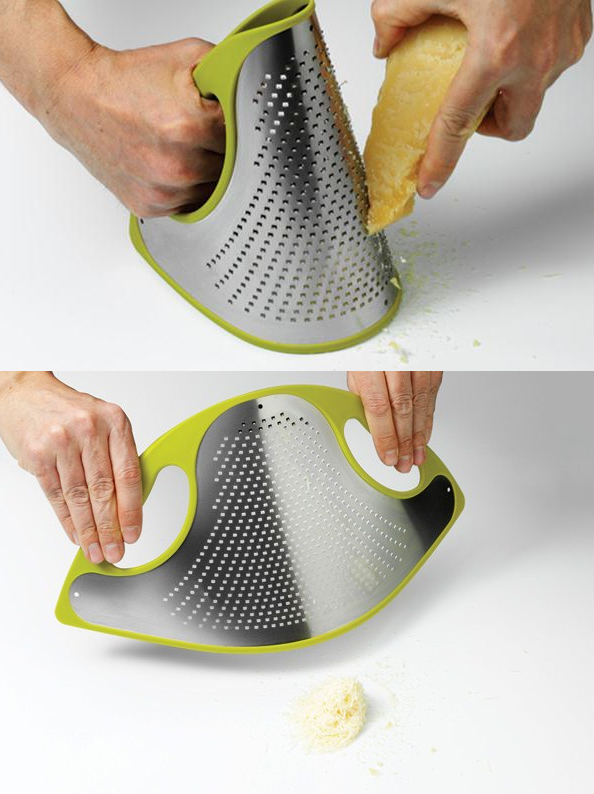 Designer Ely Rozenberg created Flexita Grater a nd was the winning entry for the Red Dot Design Award competition. Thin and flat, the Flexita Grater is unique due to the properties of the material from which it is made: harmonic steel. This is a metal that has a ‘memory’ and returns to its original flat shape after bending. In order to use the greater, one bends it gently. While it is held (with its handles) in its bent formation, it takes the shape of a conical, light, and practical tool. When it flattens out again after use, it is possible to clean it easily. The flat, flexible grater can be readily hung up or put in a drawer for storage, taking minimal space. The handles and thin edge trim are made with polyethylene injected in a silicon mould, and these parts are recyclable. The steel is incredibly thin, at just 0.2 millimetres. The use of harmonic steel makes it possible to save 50% of the materials used for typical graters. The ease of washing the flat shape can also lead to water savings of up to 80% in comparison to typical graters. The minimal weight of the grater and its flat shape allows for efficient transportation.